In November 2014, I decided to take the plunge and get involved in NaBloPoMo ( National Blog Posting Month at blogher.com ) I wasn't sure what I was in for. To be honest, I really had no idea what I was even doing. Still don't, but I'm having fun making it up as I go along. But it set in motion a great many wonderful things. Early in the process — very early, I think it was probably while I was still working out the how the hell to post to the site — I was browsing through comments other writers had left when they signed up for the challenge and I happened upon another blogging newbie: Edwina's Episodes I left a comment to say I was in the same boat and more than a little bit worried about falling out. She responded. And so began my first experience of having a blogging buddy on the other side of the globe. To be honest, I'm not even sure how/when I happened upon Breathing Life I cannot remember whether I found Mary-Anne while browsing through the long list of daily submissions, or whether she found me. Either way, I'm glad it happened. It was Mary-Anne who introduced me to the concept of having a blogheard — we both love to play with words and create new ones to better represent what we mean. Mary-Anne has become central to my heard. She too lives in the other hemisphere, in somewhere almost the antithesis of The Rock. We three bloggers who promised to post every day of November 2014 have become connected as the threads of our words stretch around the world to knit our lives and thoughts together. Brightly spun stories. Knobbly grey confessions. Cashmere soft dreams. All of them unique. Edwina of Edwina's Episodes is not Edwina. That is to say, Edwina is her middle name. I know at one point I read her regular moniker, but typically, it fell into the post-menopausal blackhole in my brain where it clanks up against all the other things I've forgotten just enough for them to irritate the be-hooey out of me. So Edwina will have to suffice. Edwina is prolific. And in the same time that I have accrued a band of followers that a camel could count on one foot, she has amassed a small nation. That and about a squillion blogging awards from her loyal folk. Generously, she has in turn nominated me for two of said blogging awards. 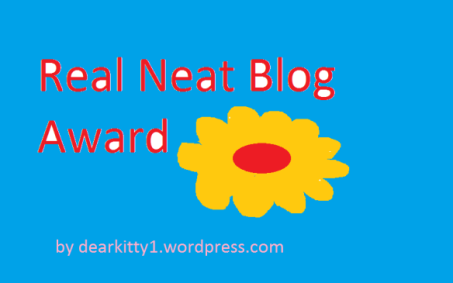 The Real Neat Blog Award is, like me, a newbie to the blogosphere. The Premio Dardos, which means 'prize darts' in Spanish, seems to have been doing the rounds since about 2008. 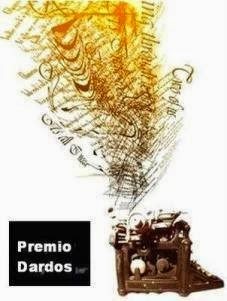 This award is given by one blogger to another as recognition of 'cultural, ethical, literary and personal values transmitted in the form of creative and original writing'. Wordy... but kind of cool. The 'rules' of these awards require me to answer a few questions about myself, then nominate a number of other blogs for the award. I'm still building up my list of blogs that keep me coming back for more. Maybe I'm a tough audience. Anyway, I'm going to thank Edwina-who-is-not-Edwina, answer the questions, but bail out of the nominations. I promise I'll post a list of blogs I've been wandering around somewhere down the track. Promise. What inspires you to write/create your blog? It had been too long since I’d written for the sheer creative pleasure of it. And the Black Dog had been more than circling. I was suffering from repeated ravaging. So I began to blog with the intention of using it as a part of training myself in the skills of positive psychology. I like me the writer.I like Wendy of the Rock, and I'm having fun hanging out with her. What would be written on your epitaph? Well at least she tried. Do you have a favourite season and why? I love spring. There are more animals and birds about. I love birds. Birds are amongst the best things about where I live. I have conversations with them all the time. Are you a realist or a dreamer? A realist with a few dreams. Would people describe you as shy or outgoing? That depends on context. Most people would say I’m outgoing, but that’s a lie that I sustain. Who would you love to be for a day? But I would never call my daughter Sunday Roast. I call those "diary entry" names. Sunday Roast; Tuesday Weld. I am so happy to be part of your heard and to have you part of mine. I too am more than happy to be part of your heard, and also Mary-Anne's. By the way, I have got quite used to being called Ewina over the last couple of months and it is much prettier than Judy(my reals name) anyway! I have really enjoyed your blogs, and the bond that me, you and Mary-Anne have built up since November. Each one of us physically so far away from each other, yet mentally so close and in tune with each other.I am privileged to have you both as my blogging buddies, and look forward to a lot more fun, laughs and whatever else comes along!